This week saw both sides realize boosts they had been previewing in recent weeks. With the Philippines hosting a series of regional defense meetings this week as part of its chairmanship of the Association of Southeast Asian Nations (ASEAN), there has been a burst of activity on security issues, including in Manila’s relationships with key bilateral partners. Among these were Russia-Philippines defense ties, which saw both sides realize some boosts that they had been previewing in recent weeks. As part of Philippine President Rodrigo Duterte’s so-called independent foreign policy which seeks to boost the country’s outreach with countries like China and Russia, we have seen Russia-Philippine defense ties strengthen slowly but surely despite the clear limits that still exist (See: “Where Are Russia-Philippines Defense Relations Under Duterte?”). That includes the conclusion of a new military pact by both sides during Duterte’s Russia visit in June and the observation of a military exercise in Russia by a Philippine military delegation in September. Officials on both sides had also been hinting that October would see a new boost for defense ties, with Russian Defense Minister Sergei Shoygu in the Philippines for the ASEAN Defense Ministers Meeting Plus (ADMM-Plus) as well as a return bilateral visit following Philippine Defense Secretary Delfin Lorenzana’s trip to Russia last December (See: “Russia-Philippines Defense Ties to Get a New Boost”). Sure enough, we have been seeing those developments play out this week. On Tuesday, Lorenzana and Shoygu signed the Russia-Philippines Agreement for Military-Technical Cooperation at the ASEAN Convention Center in Clark, Pampanga on the sidelines of the 4th ASEAN Defense Ministers Meeting-Plus (ADMM-Plus). Few details were publicly disclosed about the agreement. But Philippine officials had said that it would help both sides further establish the framework necessary for them to continue to make progress on defense ties given the new nature of the relationship. The agreement touched on areas including research, production support, and joint exercises and training. 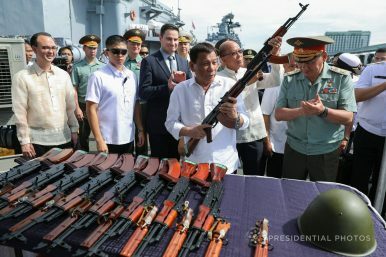 Then, on Wednesday, Duterte witnessed the expected turnover of Russian weapons to the Philippines at Pier 15, South Harbor, Manila. This included 5,000 units of AK-74M Kalashnikov assault rifles, one million pieces of ammunition, 5,000 steel helmets, and 20 multi-purpose trucks from the Russian government. According to the Philippine government, the certificate of donation was signed by Russia Director for Main Department for the International Military Cooperation of the Ministry of Defense Major General Aleksandr Kshimovskiy and Department of National Defense (DND) Undersecretary Raymundo DV. Elefante. Lorenzana, Shoygu, and outgoing Armed Forces of the Philippines (AFP) chief General Eduardo Año were among those witnessing it. Duterte and other officials also toured the facilities on board the Russian anti-submarine destroyer Admiral Panteleyev. This is the third such visit by Russian vessels to the Philippines this year. An upcoming engagement will highlight ongoing efforts by both sides to boost a nascent but developing defense relationship. Terrorism Threat Puts Russia-Philippines Military Ties Into FocusWhat Did the First Philippine Naval Visit to Russia Achieve?What’s Next for Russia-Philippines Military Ties?The Limits of Russia-Philippines Military RelationsWhat’s in the New Russia Navy Visit to the Philippines?